Okendo Reviews is a great review app, using which, shops can collect User Generated Content and allow shoppers to review the store's products. Personalizer is integrated with Okendo Reviews, therefore, shoppers can now see the products' user ratings in the recommendation boxes. Note: You have to install and activate both apps to get the full benefits of this integration. The Okendo Reviews will start showing up in the Personalizer recommendation widgets. 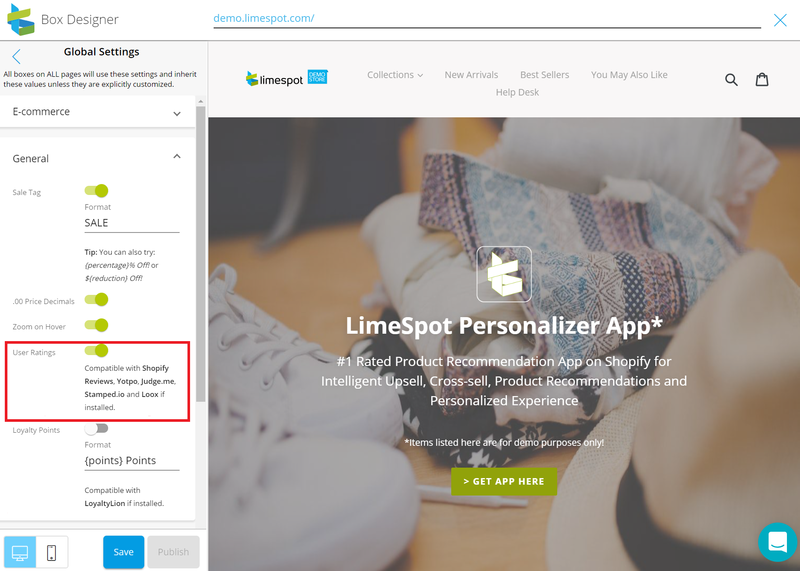 Make sure that the User Rating option in the LimeSpot Personalizer setting is Enabled. Go to your LimeSpot Personalizer account, turn on User Ratings on Global Settings > General in the Box Designer.